“A small contribution to the genesis of everyday life” is a performative piece for two, where both performers are constitutive parts of the audovisual instrument the play on. They are both electrically connected to the instruments electronic network so the audio and the video signals which are projected to the audience are running through both their bodies in their primary (the electric) form. The last has the power to select the video content on one hand – deciding which character the audio performer is interacting with (performer one, performer 2 (himself) or both of them) – and on the other hand, the video performer is a real instance of himself and can offer his physical body for the audio performer to interact with. 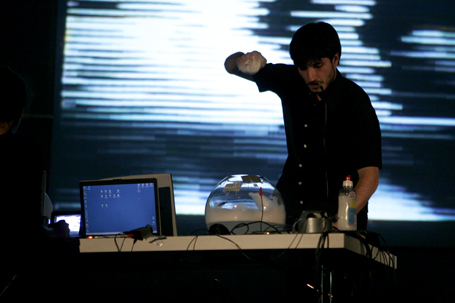 Since both performers are under an electronic potential, they would generate an audio event, as an intensity function of their physical contact. The stronger they touch each other; the more electronic current will flow through their bodies, altering the sound respectively. There is also the component of pain present in a situation where electricity is flowing through a human body. This enables a different corporal perception and interpretation of the caused sound, since now the performers do not only have the audible but also a haptic reference - i.e., pain caused by the electric current - for the choice of their following actions. Coincidentally, like in real life, physical interaction has the potential of generating a rather uncomfortable moment and requires a certain degree of effort to even happen, opposed to the virtual life – abstracted through the monitor interaction in our case – where all the inconvenience of physical presence simply does not exist. When the two performers interact on the physical level, they would establish a much stronger contact, a much grater electronic current and therefore much more pain than when interacting with the week radiation of the cathodic monitor. It is their choice.